Let you add any number of new bars and other hud elements, displaying any data, also from other mods. Adds an encumbrance bar, a weapon charge bar and a few other useful bars by default, but easy to add the bars you want. Also allows for completely new HUD styles. If you ask for permission, and haven't got a reply in 4 weeks, then consider it as permission given. OBSE 19 (or later) required. OBSE 20 is recommended, and required for some bars. 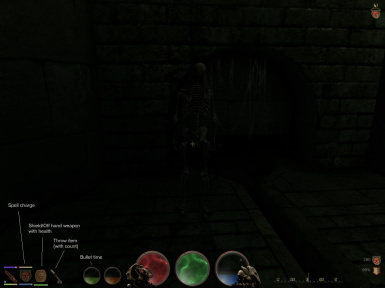 You have the three HUD status bars at the bottom left (most likely) of your hud, but with HUD Status Bars you can easily add more status bars that display anything you want it to display, like health of companions or summons, your encumbrance, charge of equipped weapon, sleep status (of sleep mods), etc. The bars can be horizontal, vertical or filled circles, or be completely custom. And the bars can have text (with or without the bar). You can easily add more bars like this yourself, by adding 2 or more lines in HUD Status Bars' ini file for each bar. "docs\Hud Status Bars ini file examples.txt" contains many other examples for you to copy into "Hud Status Bars.ini", so it is easy to add more bars even for relatively inexperienced mod users. The bars can be horizontal, vertical or a filled circle - or even completely custom styles, and can easily be placed anywhere, relative to your other hud components. The bars can also display text, both static and variable text in a number of different ways (value of max, percentage, etc). The bar can have one of any of 15 different base colors, and the color can further be adjusted individually for the red/green/blue components. HUD Status Bars lets you completely change the look of the HUD. This is done by moving/resizing/hiding the standard bars/icons, and by completely changing the look and improving the functionality of bars/icons replacing them. Example of improved bars/icons are colored enemy health bar that also works when enemy's health is buffed above normal, or sneak icon that also displays amount of light falling on player, and health bar that changes color when you get a disease. See the preset ini files, or ini file examples for such bars. HUD Status Bars have an "Hud Status Bars - base.ini" file where you define the position/hiding of standard bars/icons, and the standard look of the bars to use. By changing those, you can get a slightly improved HUD, or a dramatically different HUD. HUD Status Bars comes with three preset ini files to choose from: vanilla style, Skyrim style, and Orb style inspired by Diablo 3. Just swap ini files if you want to change it later, or adjust the existing one to your liking. 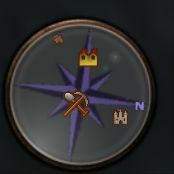 * New and better compass! * Markers change size/opaqueness depending on their distance (and also move closer to the centre of the orb compass). HUD Status Bars has an option to correct a vanilla bug in the Encumbrance display in the Inventory/Container/Barter menus - in order to avoid confusion when HUD Status Bars display one (the correct) value and the inventory menu another (incorrect) value. * See the "Hud Status Bars user guide.txt" for details of how to set up bars displaying more advanced values. * See the "Hud Status Bars custom bar guide.txt" for details of how to set up bars with completely custom look. The following bars/hud elements are defined in the Hud Status Bars ini file examples.txt file, and can be copied into the ini file. 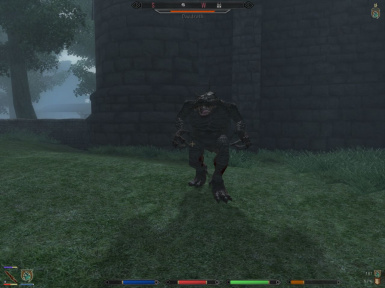 * A triple enemy health/magicka/fatigue bar, displaying the three in different colors. * Resist status for Disease, Fire, etc. Other mods, like Basic Primary Needs and Deadly Reflex 6 have HUD Status Bars ini settings in their documentation. See also webrunner's HUDStatusBar icons page (http://www.tesnexus.com/downloads/file.php?id=37965) for more bar ini settings, and additional icons to go with them. 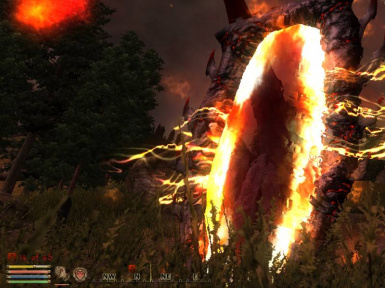 There are a number of incompatibilities with Oblivion Interface Overhaul or mods using it (Nehrim, OWC-ND). 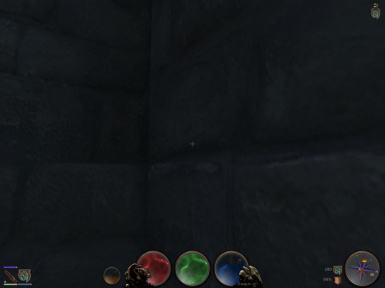 HUD Status Bars should partly work with them, but vanilla items (status bars, location text, compass, etc.) will not be recognized by HUD Status Bars, so you cannot position bars relative to those or adjust them with HUD Status Bars. I recommend that you install HUD Status Bars' optional vanilla HUD base with a compass if using Nehrim or OWC-ND. This will revert the HUD back to a style recognized by HUD Status Bars. I would appreciate comments from people using other UI mods, telling me if it works or not. HUD Status Bars should be compatible with all non-UI mods, and can be used to display values for all other mods. The mod is OMOD-ready and BAIN-friendly so installing with OBMM or BAIN is recommended. For manual install, extract the archive. Then copy the content of "00 Core" to your Oblivion/Data folder. Also copy the content of one of the "01 ... style" folders. If you use Unnecessary Violence II and want the bars for it, copy the content of one of the "20 - UVII addition..." folders too. After installation, start your game and you should see an Encumbrance bar, and a charge bar when an enchanted weapon is equipped (and a few other useful bars), without having to do anything with the ini file! But you can of course remove them or add others by editing the ini file. Make sure that you have OBSE 19 (or later) and MenuQue. Without, HUD Status Bars will simply not work at all. For the optional compasses, you must install the content of the "10 - Optional compass HUD base..." folder that is correct for you, and the "11 - Optional ..." compass folder you want. This will overwrite one file ("data\menus\main\hud_main_menu.xml") installed by your UI mod, so you may want to take a backup of the original. If you use other UI mods than the 3 supported (BTMod, DarNified UI, DarkUId Darn) or vanilla HUD, or if you already have another mod that changes the hud_main_menu.xml file, and still want the compass, look in the "HUD Status Bars custom bar guide." for details. * Rewrote the new initialization scripts for safety. * Stopped the friendly wounded health bar from displaying when looking at dead actors. * Uncompressed an Orb compass texture to make it work for people using medium/low resolution. * Made text color automatically use hud_color, hud_color_min/max, hud_color_r/g/b if the bar is a text-only bar. * Fixed a bug that made text-only bars not use hud_color_min/max, hud_color_r/g/b even if hud_textColor was set to "tnoHSB.color"
* Added Menu50/Menu80 versions of some textures that otherwise became broken for people using medium/low resolution. * Added a custom bar type, HUDbarCentered, that behaves like the Skyrim enemy health bar and shrinks symmetrically on both sides. * Reduced base size of Diablo style orbs by 50% to avoid size confusion. Added a orb_large folder with the old size for those who wants them that large. * A couple of code tweaks. * Added custom bars that work exactly like a standard horizontal or vertical bar, but with custom size/texture. * Made it possible to move/zoom weapon/magic/levelup icons, to move/hide compass, and to hide the weapon durability bar added by some UI mods. * Added new bar type: HUDbarSmall, a custom horizontal bar supposed to be used for small bars (like the weapon durability bar). * Split the ini files into a base ini file containing the base settings, and the main ini file containing the added bars. * Added 4 different ini file sets, 3 of them with completely different styles (Skyrim, Diablo 3). * Rewrote how coloring of bars work. There is now only one (white) image for each bar, and use of hud_color changes the colors without changing the image. * Added visibility timing, making it possible to only display a bar a number of seconds after something change. * Added more options for positioning bars. * Rewrote much of the xml. * Added "hud_visible" to make it easier to control a bar's visibility. * Made it possible to display the icon of any inventory item, spell or summon reference, by setting hud_type to HUDbarRefIcon. * Made it possible to display the icon of any spell effect, by setting hud_type to HUDbarEffectIcon and hud_spell_effct to the effect code. * Added default global settings for bars, and ensured that they can be changed between bar definitions. * Removed "hud_custom_color", since it is no longer necessary. * It is now possible to display bars for multiple summoned creatures. * It is now very easy to make bars that gradually change colors (see enemy health bar in ini examples file). * Corrected a bug that made it impossible to control color of static custom images. * Made text display type default to HUDtxtValue if only text is displayed. * Renamed the documents folder to docs, to fit with BAINs docs structure. * Rewrote the use of "player." 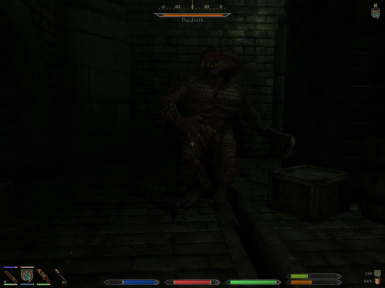 to avoid an Oblivion/OBSE bug that causes bad things to happen in combination with other mods. 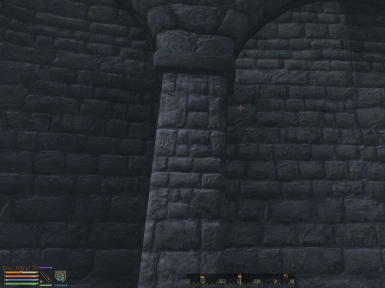 - This should hopefully fix any problems with certain HSB bars and mods like Drop Lit Torches and Shild on Back. * Added GetDisease special function/variable. - When used elsewhere, it returns the number of diseases the player currently has.